Had a blast working on my assignments for MEGA's July 2012 issue, out now with two different covers featuring rising stars of the country's biggest networks. 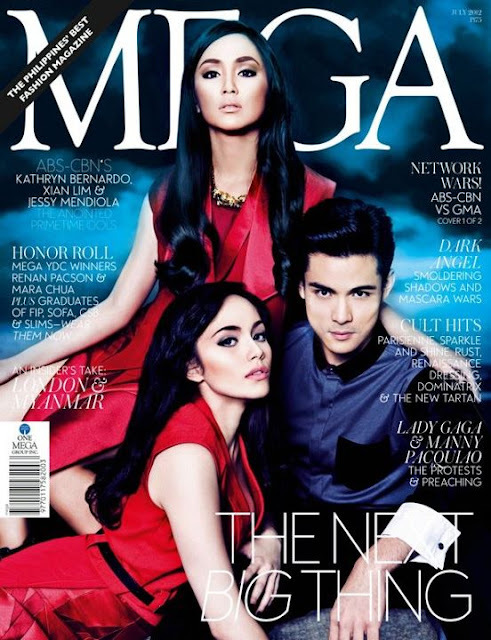 There is the ABS-CBN cover with Xian Lim, Jessy Mendiola and Kathryn Bernardo, and the GMA cover featuring Sarah Lahbati, Kris Bernal, Alden Richards and Bela Padilla. This month, I'll be blogging about what went on behind the scenes at the MEGAWOMAN shoot with powerhouse Katrina Ponce-Enrile, as well as the STYLEPHILE shoot with the sweet and talented Lanee Keh-Tan. The shoots and interviews for both features were done in one Saturday, but despite the hectic schedule, the crew had a lot of fun! Also in this issue is my article on luxe, sustainable home furnishing store W17 and the vision of its owners, Kaye Tinga and Andrés Vázquez-Prada, that will surely make Pinoys worldwide proud. Grab a copy (or two!) before they all fly off the newsstands!